(17/P93) TRENTON – The fall black bear hunt – an integral part of the state’s comprehensive policy to keep bear populations sustainable and enhance public safety – will take place Monday, Oct. 9 through Saturday, Oct. 14, in northwestern and west-central New Jersey. Next week’s Segment A of the bear season allows archery-only hunting on Monday, Tuesday and Wednesday, followed by a combination of archery and muzzle-loading rifle hunting on Thursday, Friday and Saturday. Hunting is allowed a half-hour before sunrise until a half-hour after sunset. Segment B, a firearms-only season segment, will be held Dec. 4 through Dec. 9 if the harvest rate remains within acceptable limits by the close of next week’s season segment. The December segment could be closed or extended, depending on if or when the acceptable harvest rate is reached. 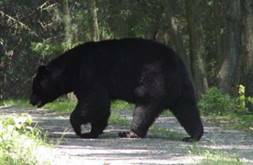 Bears have been reported in all New Jersey counties, with the highest concentration in northwestern New Jersey, which has a robust population and a high reproduction rate due to an abundance of excellent habitat and food sources. Bears primarily live in mixed-hardwood forests, swamps and forested wetlands, preferring areas with dense cover. Adult males average 400 pounds; adult females average 185 pounds. Hunters may harvest bears in five zones that include all of Warren and Sussex counties, most of Hunterdon, Morris, Passaic and Somerset counties, and small portions of Bergen and Mercer counties. Hunters may take one bear during each of the two segments with valid permits, and no more than two bears total. Bears must be taken to a designated check station the same day that the animal is taken, or the next morning if circumstances preclude bringing it to the station before it closes. Hunters must be licensed for archery or firearms by the Division of Fish and Wildlife and must secure a separate bear permit. The Division of Fish and Wildlife has made available 11,000 bear permits. Hunters may possess permits for up to two zones. The Division of Fish and Wildlife has sold some 5,400 permits to date. Permits will remain on sale subject to availability. Unclaimed lottery permits and non-lottery permits are available at license agents and online at www.nj.wildlifelicense.com. Check stations are located at the Pequest Wildlife Management Area in Warren County; the Black River Wildlife Management Area and Green Pond Golf Course, both in Morris County; and the Flatbrook Roy Wildlife Management Area and Whittingham Wildlife Management Area, both in Sussex County. Check stations will generally be open from 9 a.m. to 9 p.m. but days of operation vary, so hunters should check page 53 of the 2017 Hunting and Trapping Digest or the Division of Fish and Wildlife website for specific station information.